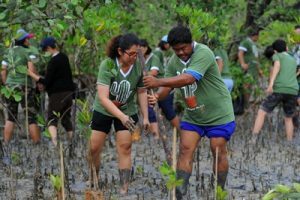 On Friday 19 May, Laguna Phuket marked 11th year of its Greening Community initiative by planting 2,000 trees; 1,000 mangrove saplings at Baan Thala Village in Paklog, a sub-district in Thalang area of Phuket, and 1,000 eggplant trees at the nearby Phuket Elderly Home. This year, 200 associates from Laguna Phuket, led by Managing Director Mr. Ravi Chandran, teamed up with 50 community members and students in this fun-filled and meaningful activity. 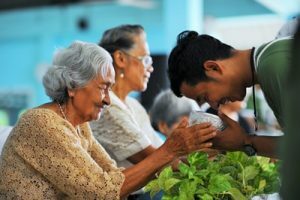 In addition to tree planting, the resort also organized a community service activity by hosting lunch and bringing lots of joy to 71 elders at Phuket Elderly Home. Supported by the initiative’s strategic partners such as Marine and Coastal Preserving Group (Paklog), Mangrove Station 23 (Phuket) and Paklog Municipality, this 11th edition of Laguna Phuket’s annual tree planting event is a part of its initiative that aims to raise awareness of global warming and help build greener communities. To date, Laguna Phuket has planted nearly 30,000 trees in Phuket and neighboring provinces, with more than 1,200 associates and 600 community members participated over the years. 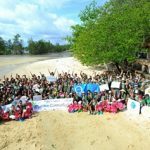 The annual activity is one of many initiatives set up by Laguna Phuket to support its wider strategic goal on environment preservation according to Banyan Tree Global Foundation (BTGF)’s worldwide guideline for each property within the group to plant at least 2,000 trees in respective community each year.